After roughly two years of lots of work I am happy to announce that TSE has just put online our new survey on Automated API Property Inference Techniques. This is joint work with Martin Robillard, David Kawrykow, Mira Mezini, and Tristan Ratchford. Thanks a lot to everyone who helped us with this work, in particular to Bart Dagenais, Michael Pradel and Thomas Zimmermann. We hope you find this text a valuable compendium. Frameworks and libraries offer reusable and customizable functionality through Application Programming Interfaces (APIs). Correctly using large and sophisticated APIs can represent a challenge due to hidden assumptions and requirements. Numerous approaches have been developed to infer properties of APIs, intended to guide their use by developers. With each approach come new definitions of API properties, new techniques for inferring these properties, and new ways to assess their correctness and usefulness. 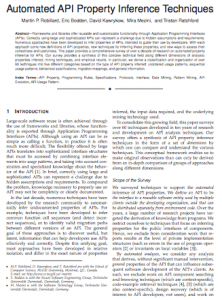 This paper provides a comprehensive survey of over a decade of research on automated property inference for APIs. Our survey provides a synthesis of this complex technical field along different dimensions of analysis: properties inferred, mining techniques, and empirical results. In particular, we derive a classification and organization of over 60 techniques into five different categories based on the type of API property inferred: unordered usage patterns, sequential usage patterns, behavioral specifications, migration mappings, and general information.